Posted on May 14, 2009 by Notorious B.U.D. The brightest stars always burn out the fastest. Goodbye Dontrelle, you will always live on in our hearts. 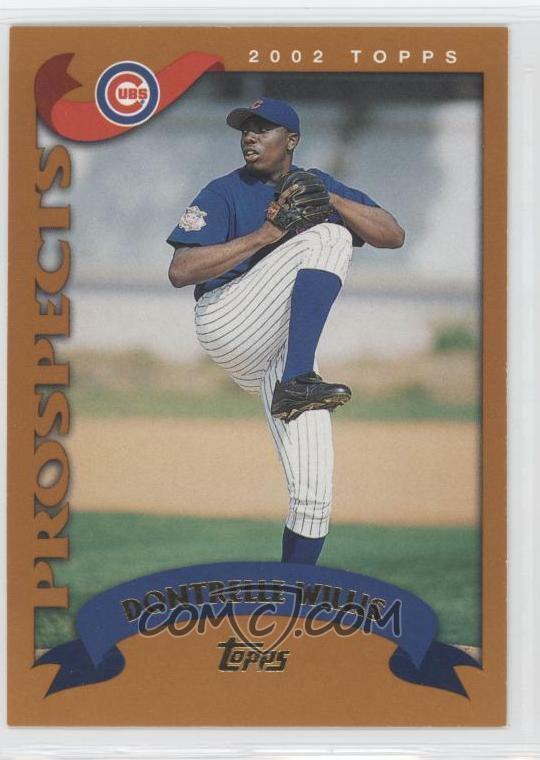 Just to clear things up, Dontrelle Willis is not actually dead (although some fantasy owners from last year may wish that upon him), but his career as a starting pitcher in the major leagues did pass away last night at the tender age of seven (2003-2009). Willis’ starting pitching career is survived by his teammates, coaches and those who invested a fortune in his rookie cards. Services will be held at the rest of Willis’ starts in the major leagues, minor leagues and old-men’s softball games. The family has requested that there be no flowers, but instead simply ask that fans don’t boo Dontrelle and further damage his fragile psyche; he may no longer be a starting pitcher, but he’s still a human being afterall. Dontrelle the starting pitcher was born on May 9, 2003 to the Florida Marlins. His first year was a season that no one would ever forget as the phenom jumped from Double-A to the majors and never looked back (until of course now, that is). The young southpaw burst onto the scene and electrified the baseball world with his big smile, herky-jerky motion and passion for the game. His meteoric rise was added by the fact that every announcer and radio personality (Don Imus was credited as the first to coin the phrase) could finally say “whatcu talkin’ bout Willis” without getting a call from Gary Coleman’s lawyer. Dontrelle would go on to win the NL Rookie of the Year award after posting a 14-6 record and 3.31 ERA. The dream season culminated with a World Series title, as the Florida Marlins defeated the New York Yankees in six games. The burgeoning star was truly the crown prince of baseball and the world had become his oyster (which should have raised some red flags at the time because of Willis’ shellfish allergy). Although he struggled the next season (10-11, 4.42 ERA), Dontrelle bounced back in a big way in 2005, finishing 2nd in the Cy Young voting to Chris Carpenter and going 22-10 with a 2.63 ERA and 170 Ks. He was selected to the All-Star game for the second time that year and even hit .261-1-11 at the plate. The boy had officially become a man, and Willis looked poised to become the black Fernando Valenzuela next poor-man’s Sandy Koufax. But even the best laid plans of mice and men go awry. Things began to unravel in 2006 as Dontrelle struggled with control (of the ball and his emotions) leading to an underwhelming 12-12 record and 3.87 ERA. The league had finally figured out Willis, and the suddenly old starting pitcher knew that his best was already behind him. But there was no quit in Dontrelle and although he realized his days were numbered, he fought on valiantly. Unfortunately, Willis managed just 10 wins in 2006, and his ERA skyrocketed to 5.17. Dontrelle was aging faster than that guy in Indiana Jones who drank out of the wrong grail, and there was nothing anyone could do to stop it. Dontrelle the starting pitcher, seen here throwing one of his last pitches, was only seven-years-old. The Florida Marlins, desperate to see their golden child succeed, shipped him off to Detroit along with Miguel Cabrera in hopes that a change of scenery might reignite his career. But things went from bad to worse in the Motor City for the fading star; Willis struggled with injuries, walked twice as many batters as he struck out, and posted a 9.38 ERA in 2008. Dontrelle started this year on the DL due to what was being called an “anxiety disorder“, but everyone knew it was merely a cover up. Willis was dying, and quickly. Dontrelle made his final start last night against the Minnesota Twins, and scouts say he passed away peacefully after allowing a 2-R HR to Justin Morneau. He went 4 2/3 innings, giving up 8 hits, 4 Rs and 0 Ks. Although Dontrelle seemed upbeat after the game, the final nails had been hammered into the coffin of his career as a starting pitcher. Willis was seven-years-old. But let’s not remember Willis as the decrepit pitcher of the past few years, a man who had a more trouble time finding the strike-zone than Angelina Jolie does finding a baby she won’t adopt. Instead, let’s think back to young Dontrelle’s days on the mound in sunny Florida, kicking that leg up to the sky and mowing hitters down like very few ever could. Willis was a once in a lifetime talent personality and we should be thankful for every moment he graced us with; baseball could sure use more players like Dontrelle (not that fans don’t love the Paul O’Neills and Gary Sheffields of the world) His time on this earth was far too short, but he did more with it than most could ever dream of.